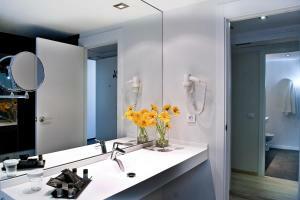 Hotel Alimara is a modern hotel located in Barcelona’s Horta district. 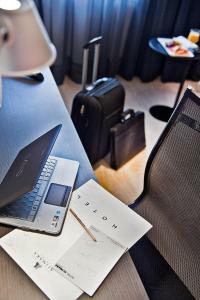 It has a fitness centre, a central garden, several meeting rooms and rooms with flat-screen TVs. All rooms at the Alimara Hotel have both air conditioning and heating. They all have a private bathroom with hairdryer. The Alimara’s restaurant serves Mediterranean food with a modern twist and there are children’s menus available. The hotel bar, SUMMUM, features a terrace and serves food, drinks and snacks. 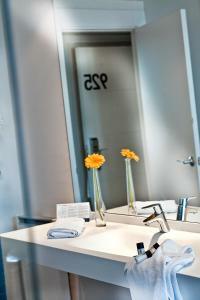 The hotel is located 2 minutes' walk from Mundet Metro Station, and it is a 20-minute journey into central Barcelona. Gaudí’s iconic Parc Güell is 4 Metro stops away from Mundet. Please note that you must contact Hotel Alimara directly to request extra beds. Unless you have written confirmation from the hotel, your extra bed is not guaranteed. Please note that air conditioning is available in the summer season. Please note that heating is only available in the winter season. 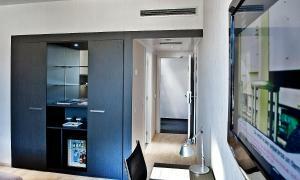 This twin/double room has air conditioning, a flat-screen TV and a private bathroom. Please note that double beds are available on request. Rate: € 73.80 ... € 417.00; select dates below to get current rates. This spacious room has wonderful views of the hotel's garden or the city. This spacious family room has bunk beds. This is a more spacious room. Its bathroom features both a shower and a bath tub. Rate: € 117.10 ... € 283.77; select dates below to get current rates. Rate: € 97.33 ... € 310.50; select dates below to get current rates. 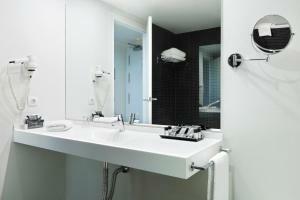 This twin/double room has air conditioning, a flat-screen TV and a private bathroom.